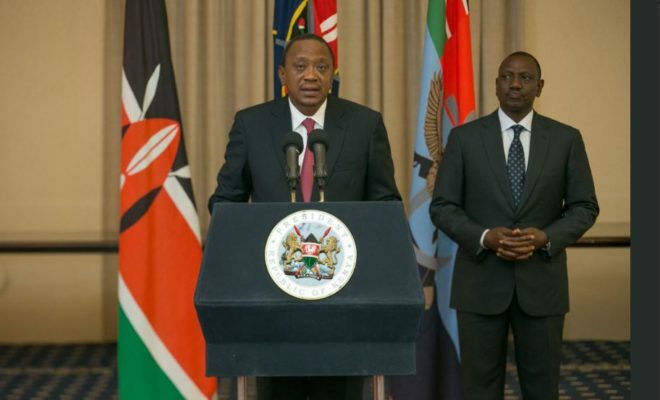 NAIROBI, KENYA: Seven cabinet secretaries have failed to make it to President Uhuru Kenyatta’s second term list but have landed jobs elsewhere. When unveiling his promised second list, the president knocked out Judy Wakhungu (Environment), Cleopa Mailu (Health), Dan Kazungu (Mining), Phylis Kandie (Labour), Willy Bett (Agriculture), Jacob Kaimenyi (Lands) and Hassan Wario (Sports) from the cabinet list but reassigned them duties in foreign missions. He moved Dan Kazungu to Tanzania as the High Commissioner, Judy Wakhungu (ambassador France),Phylis Kandie (Belgium), Willy Bett (India), Jacob Kaimenyi (UNEP) and Hassan Wario to Austria. Former politician Kiema Kilonzo has also been named Kenya’s High Commissioner to Uganda while Lazarus Amayo lands a deal at the United Nations. The president also created petroleum and mining cabinet post and appointed former Turkana Senator John Munyes as the Cabinet Secretary. The appointments come after days of pressure on President Uhuru Kenyatta and his deputy William Ruto to name the list of men and women to help the fulfil their promises in last leg of Uhuru’s term. Perhaps keen to leave a lasting impression, President Uhuru Kenyatta has identified manufacturing, affordable housing, healthcare and food security as his areas of focus for the next five years. Christened the ‘Big Four’, their outcomes include building 500,000 low cost houses, universal healthcare, a 10-fold exports increase, irrigation of 1.2 million acres of land, and millions of new jobs.